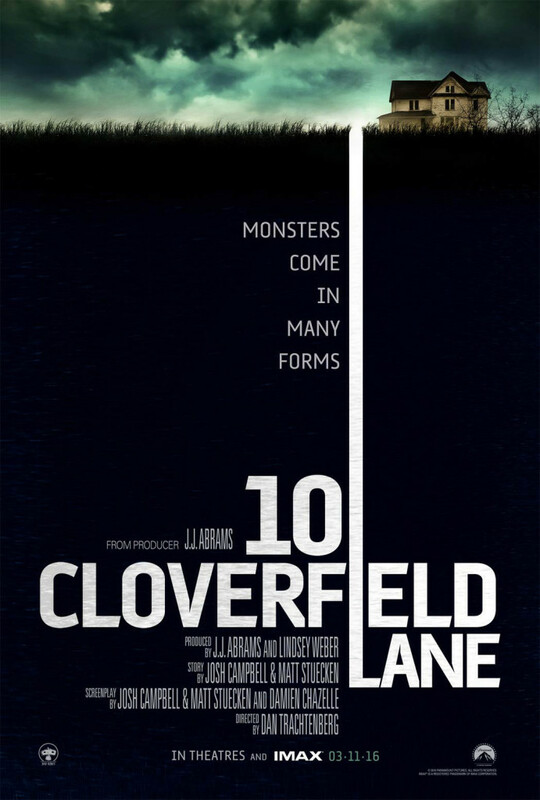 What’s the verdict: Back in 2008 Cloverfield emerged from nowhere to impress and shock the pants off audiences, so it’s fitting this “blood relative” (to use producer J.J. Abrams’ term) does the same. Released with little fanfare save for a spoilerish trailer best avoided, 10 Cloverfield Lane is as unusual and thrilling as the first movie, but that’s where similarities sharply drop off. Gone is the shaky hand-held footage, replaced from the get-go with elegant tracking camerawork and smooth Shining-like helicopter footage of Michelle’s car leaving the city for the countryside. Gone too is the sprawling metropolis of New York City, the playground of Cloverfield’s monster. Instead we get an intense chamber-piece of claustrophobia, paranoia, forced bon homie and… what exactly? An unseen but very genuine threat or a xenophobic fantasy? Cloverfield may be on the mailbox, but this film is a very different beast (pun intended) with no guarantee it is playing in the same sandbox as its spectacular forebear. And debuting director Dan Trachtenberg and writers Josh Campbell and Matthew Stuecken (assisted by Whiplash supremo Damien Chazelle) like it just fine that way. Coming on like a quasi-sci-fi version of Room, there is tension and suspense aplenty and a firm belief that hell is other people. John Goodman’s kindly menace is utilised to unnerving effect, his broad-shouldered, soft-spoken intensity cramping the actually quite spacious bunker. Even a cover of Tiffany’s pop bubblegum classic I Think We’re Alone Now on Howard’s jukebox chills the atmosphere (just as De Niro’s rendition did in Scorsese’s Cape Fear). Blessed relief comes from Michelle and Emmett, regular people made believable by performances of real chemistry from Winstead (for whom this hopefully marks a return to A-pictures) and The Newsroom’s Gallagher Jr.
10 Cloverfield Lane is best viewed knowing as scant information as possible going in. Brimming with surprises it achieves the impressive feat of being a sort-of franchise movie that is not guessable just from the title. As the climax approaches there are credulity stretching moments (fashion design is a must-have skill for possible apocalypse situations), but come the final, teasing shot most audiences will not want to wait another eight years before visiting Cloverfield again.